With this sharp line, Black Agenda Report’s Glen Ford summed up the net effect of the Bernie Sanders’ campaign on the Democrats. But he also discussed a lot more at a forum on the US presidential elections held in Oakland on Feb. 5. It’s not that Ford supports any wing of the Democrats, including the Bernie Sanders wing. “Black movement politics, black radical politics cannot coexist with Democratic Party politics…. We have not transformed the Democratic Party; the Democratic Party has transformed us…. So we should be saying ‘all power to the movement and to hell with both wings of the rich man’s party. Power to the people!” he concluded. There were several other speakers, but the most important issue to be considered is: How can a real alternative to the “two party system” – the monopoly over US politics by the Republicrats – develop? Other speakers at the forum represented different candidates for president. None of them will make any impression either on black voters or on the vast masses of working class people in the US in general. That’s because the dynamic that Glen Ford described is not unique to black voters alone. Millions of workers in general have a similar perspective – they’re looking for a protector against the Republicans. Since those millions of people are paying attention to the presidential election, socialists cannot just ignore them. But we make a mistake to become mesmerized by these elections; even while they are going on, local protest movements are going on all around the country. They involve issues like lead in the water in Flint, MI, fracking throughout Colorado, and of course the issue of racism, the police and the criminal (in)justice system in general. There already is a tendency for some of these movements to throw up candidates at the local level. We are not talking about opportunists like Delray McKesson, who is trying to use the movement to advance his own career in Baltimore. We are talking about real movement leaders who are running outside of and against the entire Republicrat paradigm. 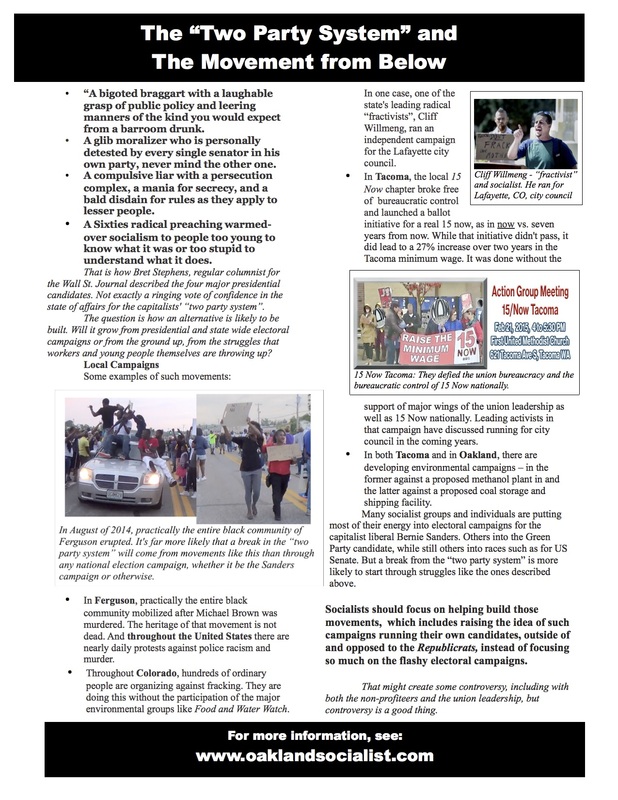 Socialists should participate in these local movements. Help build them. And part of helping build such movements is to encourage them to openly break from the Republicrats and put up their own candidates for local office. Running “outsiders” for president, US Senate or even state wide office is biting off more than we can chew. Given the present state of the movement, it tends to fall on deaf ears. Running workers’ leaders in local elections, outside of and opposed to the Republicrats, and based on the real movement in the streets and communities – that can start to gain some traction. That can be the first step towards building the alternative to the Republicrats. The Democratic Party is drenched in blood arising from wars, regime changes and “humanitary interventions” across the globe and from domestic policies that have enriched their donors and demolished the lives of millions. Glen Ford’s BLACK AGENDA REPORT (http://blackagendareport.com) does a great job with himself, Margaret Kimberley, Bruce Dixon and others tracing the pain inflicted on American Blacks (and the rest of us) by unscrupulous Democrat politicians. The only disagreement with this comment is the idea that workers who support the Democrats are “fools”. There are lots of reasons for their doing so – none of them justifiable, but also those reasons don’t make them “fools”. The real fools – and that’s putting it mildly – are the union leaders and the non-profiteers who are leading workers and youth into the Democratic party.